The Artesia City Council opted to eliminate the Water Department’s longtime drive-through lane at Tuesday’s meeting but will install a stand-alone drop box in City Hall’s west parking lot in order to allow residents to continue to make their payments from their vehicles. The council was presented with three proposals at its June 27 meeting, only one of which kept the drive-through payment lane as-is and its pneumatic tube payment system intact. That plan, which was listed with a cost of $94,000, would have eliminated a few of the extra parking spaces that were the city’s motivation for altering the west side of City Hall. 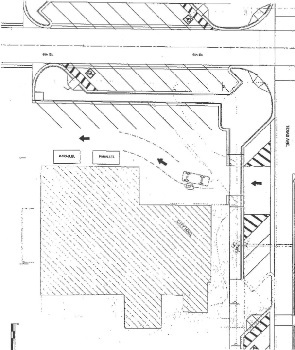 The council had originally planned to eliminate the drive-through lane entirely as part of the ongoing Texas Avenue reconstruction and install a payment drop box into the north side of City Hall, which would have required citizens to exit their vehicles and walk up to the building. The council had assumed residents not wishing to walk up to the building or into City Hall to the Water Department itself to make payments would switch to either mailing their payments or paying online at artesianm.gov. However, after a local disabled veteran discovered that plan upon a visit to City Hall, concerns were raised. That veteran cited the difficulty entering City Hall posed for the handicapped, as the building does not include automatic doors. After that fact was called to the city’s attention, automatic doors were ordered and, according to Infrastructure Director Byron Landfair at the June 27 meeting, should be installed within the next 60 days. Some Artesians were also reluctant to give up the convenience of dropping off their payment by vehicle, and opposition to the mail and online options included the fact that many people no longer hold checking accounts or feel mailing money is unsafe, and that the online payments come accompanied by an additional fee. At Tuesday’s meeting, the council opted to select the plan with the smallest price tag — $65,000 — which will allow vehicles to continue to enter the now-dedicated parking lot on the west side of the building via Texas Avenue. Rather than exiting onto Sixth Street, however, vehicles will move through to the alleyway south of the building to exit. A stand-alone payment drop box will be located in the parking lot as vehicles move past. The former Sixth Avenue exit will be curbed, with parking spaces established along Sixth Street, and additional spaces will be created in the new lot, with the drive-through lane moving behind them. The council said the option made the most sense as far as traffic flow is concerned and still allowed the public access to a drive-up payment option. Residents spoken to today said they will be sad to see the pneumatic system go, as they preferred knowing their payment had been received immediately by Water Department employees rather than left in a drop box but that they are pleased a drive-up method will still be available. In other business Tuesday, the council announced the hiring of Tieler Palmer as a receptionist at a pay rate of $2,037 per month; Sarah Mitchell as administrative assistant at the Artesia Fire Department, $2,673 per month; David Orquiz as a Parks Department equipment operator, $2,482 per month; and Dominic Cadena as a recreation specialist, $2,305 per month. The council also approved a resolution placing a moratorium on the installation of new, freestanding, off-premise signs and the annual resolution and agreement with the Southeastern New Mexico Economic Development District/COG. The city opted to postpone approval of its Internal Controls Policy until a final draft could be presented at its upcoming retreat. • a Memorandum of Understanding with the Eddy County DWI Program for DWI offender tracking services. • an industrial lease reassignment from Nadel Gussman Permian to Fisher Sand and Gravel for Lots 3 and 4 of Block 2 of the Artesia Industrial Park. • reappointment of Lynn Atteberry, Emma Salgado, Doris Ivy, Rosa Mariscal and Rita Rainwater to the Commission on Aging Advisory Council (terms to expire June 2019). • the resignation of Rigo Chavez, police corporal, effective June 28. • permission for one police employee to attend Advanced Roadside Impaired Driving Enforcement (ARIDE) training in Ruidoso. • permission for two police employees to attend FBI NIBRS training in Las Cruces. • permission for one police employee to attend Instruct Ethics and Stress Management training in Hobbs. • permission for one planning employee to attend the electrical inspectors’ meeting in Tularosa. • permission for one recreation employee to attend the New Mexico Recreation and Parks Association board meeting and mini-conference in Albuquerque. • a request by Forever Free Fellowship for the use of Guadalupe Park from 4-10 p.m. July 23-30 for their annual tent revival. • a request by Amy Mathis and Judy Stewart on behalf of Artesia High School for the use of Main Street from Bulldog Boulevard east to Second Street from 3:30-5 p.m. Friday, Sept. 8, for the annual Homecoming parade.